Uber Parks Its Self-Driving Truck Project, Saying It Will Push For Autonomous Cars The move comes after Uber has spent roughly $925 million in recent years to jump-start its effort to create a viable line of self-driving freight trucks. Two years after Uber paid $680 million to buy the self-driving truck startup Otto, the company is folding that effort. 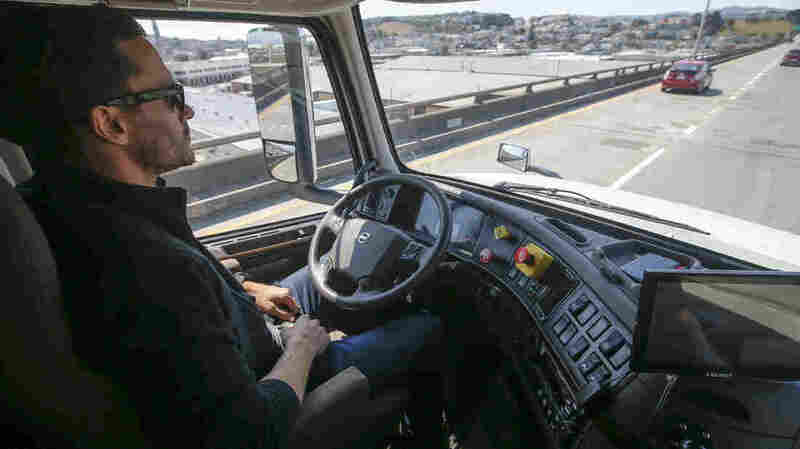 In this photo from 2016, an Otto engineer sits behind the steering wheel of a self-driving, big-rig truck during a demonstration in San Francisco. The move comes after Uber has spent roughly $925 million in recent years on its effort to create a viable line of self-driving freight trucks — an initiative that was seen as having the potential to remake the trucking industry. Uber bought Otto, a young startup that was founded by former Waymo employees, for $680 million two years ago. Months later, Waymo and Alphabet (Google's umbrella company) said that Otto's co-founder, Anthony Levandowski, had raided Waymo's design server. Levandowski left Uber shortly after Waymo made its accusations. The two companies settled the trade secrets case in February, with Uber agreeing to give Waymo some $245 million worth of stock in the car service company. With the new shift, Uber says that where it can, it will move employees from the trucking unit to work on self-driving cars. It will also continue developing its own LiDAR system — the technology that allows self-driving vehicles to see the world around them by using lasers to shape an evolving 3D image of other objects on the road. While it's abandoning the self-driving truck project, Uber will try to build its Uber Freight business — also called "Uber for Trucking" — which looks to disrupt the freight industry by directly matching truck drivers with shippers. Introduced in May 2017, that part of the company's trucking strategy "is unaffected by this decision and remains one of Uber's most promising businesses," says Uber spokesperson Sarah Abboud. Last week, Uber moved to restart public tests of its self-driving cars project, after a tragic incident in March in which one of its cars struck and killed a pedestrian in Arizona. In response, the company had suspended its autonomous vehicle operations in Pittsburgh, Tempe, San Francisco and Toronto. Discussing Uber's renewed focus on self-driving cars, Meyhofer added, "We recently took the important step of returning to public roads in Pittsburgh, and as we look to continue that momentum, we believe having our entire team's energy and expertise focused on this effort is the best path forward."